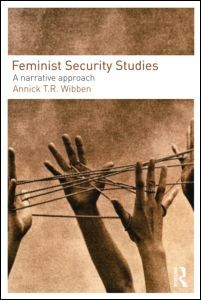 Feminist Security Studies: A narrative Approach by Annick T. R. Wibben is a deep and engaging piece of work that explores security theory from a feminist perspective. The central claim of the volume is that a narrative approach to security studies based on everyday experience and ethnographical research allows for other marginalized and silenced understandings and narratives of (in) security to be taken seriously. To accomplish her goal, the author critically introduces feminism as a political project and, as such, as a transformative force in the constitution and definition of security studies. The volume asks questions ranging from the theoretical “how is the formation of security meanings approached, how does it set the parameters for the particulars of security studies and security policy?” to the contemporary practical of how much a researcher is open to engage in self-reflexive research processes and develop listening practices that go beyond finding stories that provide authenticity for preconceived ideas. The book is well-structured and the argumentation easy to follow. The contextualization laid down through the first two chapters of the book aims precisely at presenting why and how feminist perspectives and methodologies can improve upon and challenge mainstream IR and Security Studies explanations, prescriptions and assumptions. The author argues that current security narratives include a clear and rigid structure containing 1) threats that locate danger; 2) referents to be secured; 3) agents charged with providing security; and 4) means by which threats are contained and security provided. The security narratives that do not conform to this are not recognized as such and are pushed aside. The author invites the reader to reflexively consider what counts therefore as knowledge and what can be considered as a security issue, why and for whom, as well as which silences are hidden behind the unified conceptions provided by security studies scholars and policy-makers. The following two chapters elaborate on a narrative methodology able to bring light to the many silences that existing security narratives impose on women’s issues in IR. It first describes how narrative ordering processes work and how there is always a greater diversity of narratives than those allowed in the public realm, with different beginnings and endings and a whole range of definitions of (ab) normality. She argues that current methodologies impose a framing on binary terms that impedes the recognition of similarities and continuities and that provokes the demonization of the Other. Then she uses 9/11 events as an example of how different narratives offer new and detailed accounts about women’s experiences of (in) security. In this way, the author takes us step by step to the final chapters where she develops a Feminist Security Studies approach that is political, critical and self-reflexive. That is, while the first objective of the book is to develop and illustrate a feminist narrative approach to security, the volume also constitutes a claim against the politics of ubersecurity and the type of security practices nowadays legitimized at the expense of insecurity for those whose voices have been marginalized. Although the volume provides a first opportunity to overcome the monopolization of a narrative on security, the socioeconomic dimension is underdeveloped. Some hints as to the importance of race, class and geography on narratives of security are dropped by through quotes from other feminist researchers’ work on indigenous women in Latin America or Korean women serving American soldiers. However, her argumentation against security narratives based on crisis-based approaches that silence sustained resistance to omnipresent systems of oppression would have benefited from a more pronounced engagement with feminist political economy arguments. This is all the more vital since the book makes a clear link between security narratives and narratives of political identity, very much conditioned by socioeconomic context. Additionally, as a volume advocating for a methodological turn, some readers would appreciate clearer directions in the latest chapters as to how to put in practice such a narrative methodology. Given the sustained engagement with a narrative approach to IR, this book should be widely adopted in graduate International Relations, International Security and Gender studies courses, where stimulating research and innovative doctoral projects will likely be sparked by it. The theoretical sophistication of the book deters against oversimplifications and generalizations and, in so doing, challenges current trends in social sciences research that tend towards uniformity and clear-cut results more characteristic of a natural sciences milieu. The advocacy of a more self-reflexive approach in which the researcher listens actively and carefully to the subjects of research opening up the space for new understandings and versions constitutes a democratization of research in a field very much in need of it.